The deputy president’s refusal to ‘entertain’ tweets from the finance minister has been met with some support. 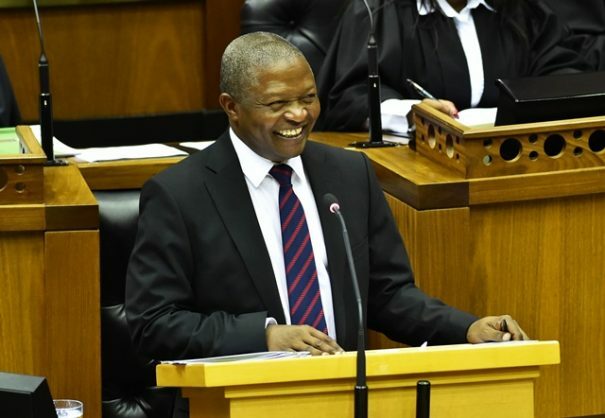 At a Q&A in parliament on Tuesday, Deputy President David “DD” Mabuza made a statement about Finance Minister Tito Mboweni which has caused a stir on Twitter. Mabuza said: “I don’t really take the minister of finance seriously when he’s making comments”, adding that when the minister tweets, “it’s not a government position”. Mabuza was discussing the privatisation of state-owned enterprises, something the finance minister has tweeted about in his personal capacity. “I don’t think that’s the way we should approach this debate, whether there are certain entities that must be privatised, certain SOEs, this debate must not be approach this way,” the deputy president said. “I don’t really take the minister of finance seriously when he’s making comments. These are his own comments,” he continued. Mabuza’s comments caused a stir on social media, inspiring comment from, among others, EFF deputy president Floyd Shivambu, former Financial Mail editor Barney Mthombothi, former Eskom CEO Matshela Koko, and 702 and Cape Talk presenter Bongani Bingwa. Shivambu simply posted a link to a video of Mabuza’s words, while Mthombothi asked why the public should take Mboweni seriously if even the deputy president doesn’t. Bingwa, meanwhile, said Mabuza “puts his foot in his mouth” every time he speaks in parliament. Several Twitter users said Mabuza was right about Mboweni, while others said they didn’t take the deputy president seriously either. Mboweni, who is currently in Zimbabwe for the Binational Commission, which seeks to strengthen ties between South Africa and its neighbour, has not yet responded. Mboweni has advocated for greater socialisation of capital on Twitter. He trended in April, 2018, for a series of tweets in which he typed up a short prayer asking for leaders to open their eyes and ears and “do four things”. We may have found it funny what DD Mabuza said about Tito Mboweni, but it's not, DD gave the Coke smoking minister valuable advise about how one should carry themselves when they are in position of power. When the deputy prezident of our cowntry does not take the finance minister siriyas,???????? should we cry or shall we sigh? I think needs to looked at is that Tito has a tendency of talking without considering his comments properly, and when someone like DP challenges such comments we start to view Mabuza on wrong side. This Tito Mboweni guy he has a tendency to condescend black people, I also don't take him seriously, as for Mabuza we know ANC likes to give us incapable, incompetent leaders we know that.